Silk painter Aimee French loves the tactile sensation of moving the paint onto the silk with her brushes. Whether abstract or realistic, that sense of motion and color are inherent elements in her paintings. Her fascination with abstract shapes dates from her early childhood when she would tear up paper into tiny pieces and save them in bags. As an older child she spent more time arranging her dolls’ living spaces than playing with them. This interest in space and shape lead to her enrollment in Ohio State University as an architecture student. Once there she discovered a deeper affinity for fine art and changed her major to painting. 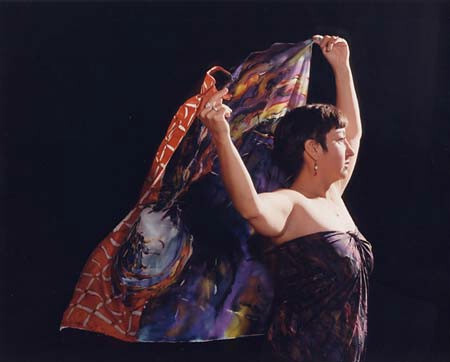 It was six years after graduation before she discovered the fluidity of working with paint on silk. Today, she enjoys the public’ s reactions to her art, whether surprised, intrigued, upset or repelled. French sees these strong emotions as one measure of success. Her ultimate goal as an artist is to move her audience and at the same time gain their trust and respect.